Do I need to landscape before installation? You are here: Home / Fence School / Do I need to landscape before installation? Yes and No. With our post driven system for fences we usually can install our fences through flower gardens without much disruption to your plants. We can advise if there are any plantings that might need to be moved prior to installation. Fresh sod would prefer not to be walked on until it’s settled. We can do our job on a new lawn if necessary, but in that case you must hold off on the watering for a few days before we come to do the fence. 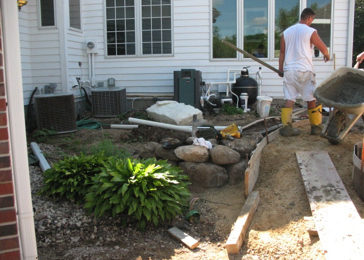 Every yard and job is different, so please consult with us first. For a free estimate and consultation with our friendly staff, call 608-849-4654 or 800-LE FENCE (800-533-3623 in WI, IL, IA, IN, and MI).Or email sales@quallinefence.com. Better yet, visit our shop in Waunakee near Madison to find the fence for you. What regulations can impact my fence project? Do I need a survey to put up a fence? Can fencing protect my property from wildlife?